If you’re after a new motorcycle challenge, look no further. As the summer months approach, you can finally look forward to lighter nights and plenty of sunshine (hopefully). Younger motorcyclists are facing competition on the roads as an older generation gets back on their bikes. The time has come to buy your own motorbike. You’re confident on the road, and you’ve proven you’re worthy of a licence. Now it’s time to take a trip to an esteemed motorcycle dealer like Metropolis Motorcycles or see what you can find online. 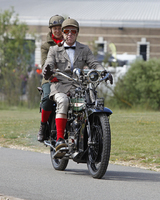 Around 500 Veteran and Vintage motorcycles will ride out together when the Heritage Motor Centre hosts the nostalgic Vintage Motor Cycle Club Banbury Run on Saturday 21 June. Suzuki's new V-Strom 650XT is now available in dealerships nationwide, with pricing confirmed at £7,499. Tens of thousands of keen motorcycle enthusiasts from across Europe will make their way to the NEC later this month for the largest and most prestigious event on the two-wheeled calendar. Learn... to ride a bike! Motorcycle Live is the UK’s biggest bike show, but that doesn’t mean it’s just for born and bred bikers.